Philip Guston and the Poets - launched in occasion of this year’s Biennale in Venice and currently hosted at the charming venue of Gallerie dell’Accademia - is an exhibition curated by Kosme and Baranano, focused on the US artist’s homage to the poets who mostly influenced his work. The choice of Venice as provisory home to the 50 canvases and over 25 drawings - among them some of the most significant ones by Guston - was not casual, but rather embed in the artist’s personal history. Born Philip Goldstein in Montreal, Canada, he frequented the Los Angeles Manual Art High School - along with Jackson Pollock - and the Otis Art school which he left early. Winning the Prix de Rome in 1948 meant he could fulfil his dream of traveling to Italy, and his trip there resulted in a dramatic change in Guston’s artistic language: his work became a reflection of the bohemian Italian surroundings to it; pink became his most favourite colour and the ruins he depicted acquired their own life through it. De Chirico was always a significant reference for Guston, but when he suddenly fell short, the artistwas required to look somewhere else. That’s when he was captured by the poets - Lawrence, Yeats, Stevens, Montale and T.S. Eliot among them - and this Venetian exhibition is nothing but a chance to try and understand more behind the reason for this new direction he embraced. What all these authors have in common is the strong visual images they used to build their poetry around: fragments of the past, their travels and various sensations which - combined together - generated something new and carried a brand new meaning. 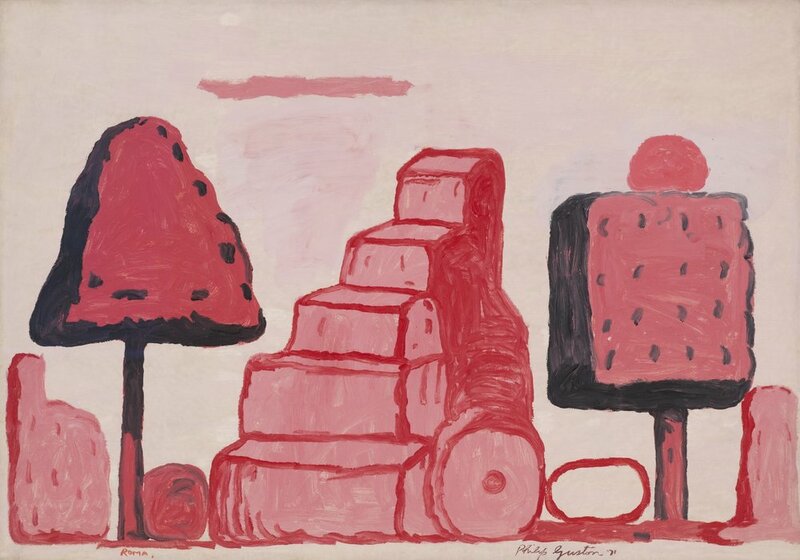 Guston worked in the same way, by looking at fragments of his life and what he saw around him in order to try and balance in his painting actual objects versus what his mind saw in them. ‘Nothing has changes’ Guston used to reply to the ones asking about the sudden changes of style in his work ‘it’s always the same’. But the objects which he first represented as blurred - almost upsetting - got sharpened to the point of becoming realistic through his career; the colours which used to be blended into one another acquired a plastic element to them. What never changed in Guston’s work was his message: no painting is ever unfinished, but every work is the continuation of the previous one. Each canvas is the sketch of a future canvas too and this tension is the true strength of the artist’s representation. The unfinished becomes art form and acquires an expressive value, as the author proceeds toward the finishing of the piece. Is the attempt of achieving a finished piece of work that comes across Guston’s paintings, transforming them into refined, fascinating compositions. Many thanks to Andrea Schwan Inc.